safari guide can stop a terrorist attack. 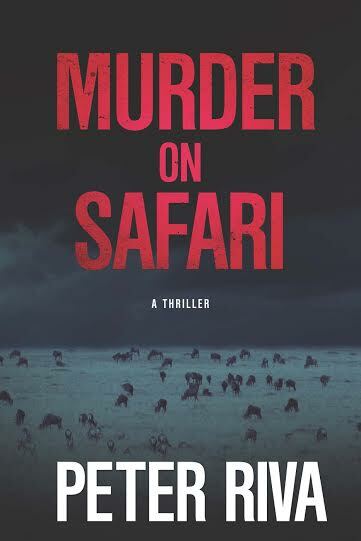 I am going to start with the fact that, of the 2 books I have read by author Peter Riva, Murder on Safari is my overwhelming favourite.. It hit the sweet spot for me and I literally consumed it in a few nights. The book is well written and managed to quickly transport me away to foreign places. Labelled as action and adventure - perfect choices by the way - the author offers so much more. Africa really comes alive. In the book, the main character - Pero Baltazar - is at the beginning of a new filming expedition. When one of his party dies on the first day of filming - a race to stay ahead of evil forces ensues. Although the crew changes locations, they cannot shake their pursuers. They also learn of a terrorist plot that will result in the dead of hundreds of thousands. What they don't know is how it will be achieved. The plot moves along quickly, keeping you turning the pages to see what happens next. Riva's not only created great characters in this book, but managed to bring them to life physically. As I moved through the story, I could picture how each person looked and understand who they were. Their voices took shape. The same goes for the African cities and countryside the characters moved through. The airport terminal, the vehicles, the tents - all became substantial. The world around me disappeared as I gave myself over to the sights, sounds and smells of Africa. Each time I took a break, I was always surprised by how much time had passed. Kudos to the author. This book is a definite must read. To read a behind the scenes interview with the author click HERE!